As Wildy is currently up in the Sounds patiently waiting for us to head up for the Christmas holidays, our friend Willie asked if we would like to take his wife Vonda’s boat out for a sail in the Wednesday night twilight race. Andrew and I jumped at the chance to get out on the water having both felt like we have been missing a limb since Wildy has been away. 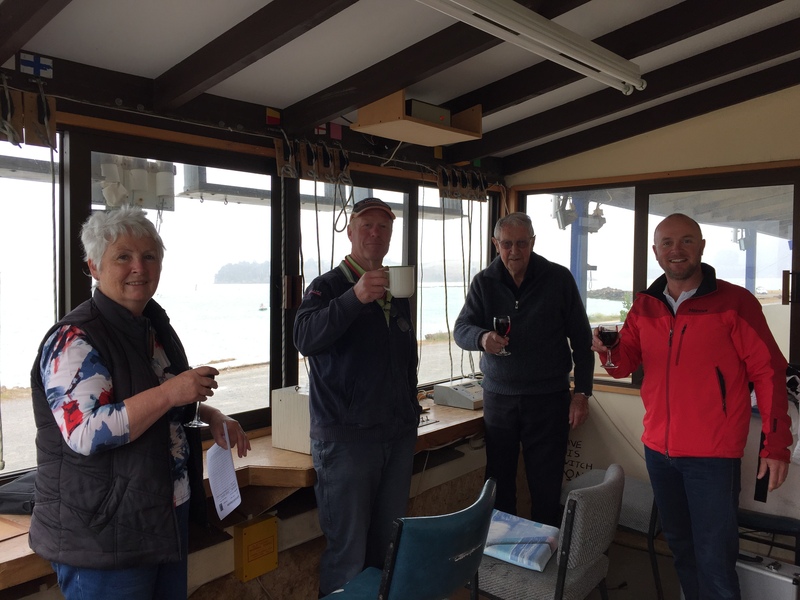 However when we turned up at the yacht club the wind was howling, the grey clouds were threatening to pour, and the waves looked much higher than the sides of the Noelex 22 we had been invited to sail. While we chewed the fat in the car park procrastinating about making a decision as to whether we should launch the boat or go to the pub instead, someone suggested we might like to go and help in the start box! Well I am ashamed to say that I have never been to the start box! These fantastic volunteers turn up every Wednesday and Saturday to run the races for us. Without them our racing wouldn’t happen, and yet I had never even been there in all my years of being involved at the club to see how it was done! We jumped at the chance, bought a bottle of wine, put the boat back in its park and hot footed our way over to the little start box overlooking the racecourse. The view out over the racecourse is amazing! It is cosy, but there was plenty of room for Willie, Andrew and I to join in with Malcolm and Shirl, the start box operators. When we said we had brought wine they were even happier to see us and show us around! Malcolm is 84 years old and has been doing this job for 40 years! What a legend! Shirl and her dog Benji come along and take the times. 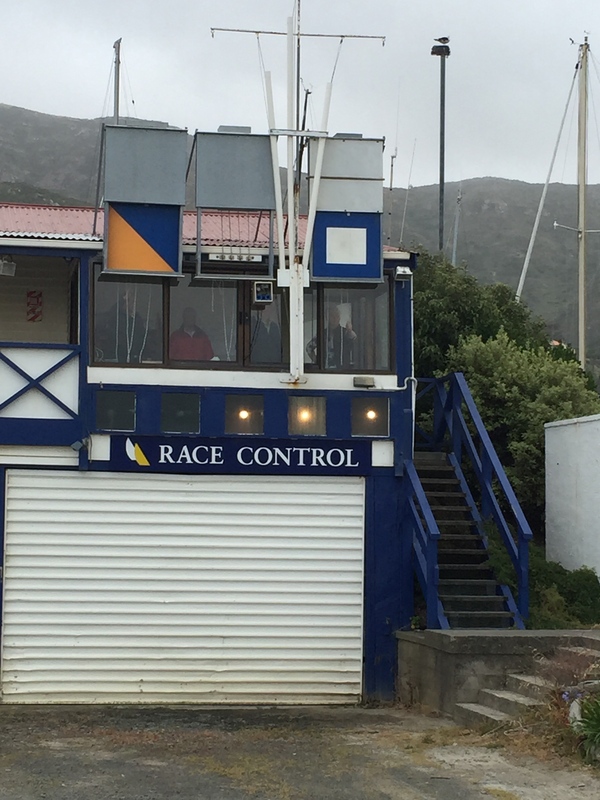 The twilight races are run over a triangular course and the times are taken for every lap that the yachts do. Malcolm looks out for the boats through the binoculars as they come past and when they cross the line (which is marked by a metal strip in front of the glass then Shirl takes a note of the time. These are then delivered back to Ross at the club at the conclusion of the races and he applies the handicap to get the final result. Lots of fun! There is a special electronic box which does the countdown sequence and lights which show the time remaining to the start. The flags dictating which class the start relates to and the Blue Peter flag are all operated by Shirl by using the halyards to raise and lower the flags. There are lots of other flags in the start box as well, not sure when they fly them, which is just as well because as a skipper I am not sure if I would know what they mean either – must swat up on that…! It looked like challenging conditions out on the racecourse, and we commented on how cosy we were compared to the sailors out on the water. The gusty Nor-Easterly put everyone through their paces and a couple of boats retired with breakages. Thankfully for the sailors, the rain held off and after the race we headed back to the club. This was a crucial race for the top three boats who all had to turn up tonight to decide who won the trophy for this twilight series which was very kindly sponsored by Grant from Oborns Nautical. Robbie Gibb and the crew of 12 Gauge won the trailer yacht division and Dudley Jackson and the crew of Good Point won the keelboat division. Congratulations everyone! But thanks most of all to the volunteers Malcolm, Shirl & Benji in the start box, Ross who does the handicaps and Joss in the rescue boat. Without you guys us sailors would not have the opportunity to get out there and race. It was a pleasure to get to experience this from the other side of the fence, and I can highly recommend it to anyone else who would like to get involved! So cool you got a chance to do this and have a new perspective on the racing!